OVERLAND PARK, Kansas (April 10, 2018) - Hoppe’s, the best known name in gun care products, announces the signing of Lena Miculek to Hoppe’s Sponsored Shooter Program. She will represent Hoppe’s at USPSA and 3 Gun competitions, as well as assess and develop new products. Miculek is a competitive shooter from Arkansas, who started shooting competitively at just 8 years old. 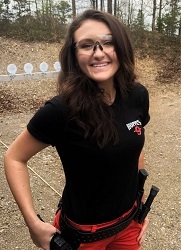 Working as a full time professional shooter for 6 years now, her past accomplishments include placing in the lady division at the NRA World Shooting Competition, IPSC Rifle World Shoot in Russia and High Lady at the USPSA Optic Nationals with PCC.